Memorial Day begs for an outdoor feast featuring mouthwatering grilled meat and tantalizing side dishes. This healthy Memorial Day menu includes a mouthwatering stuffed pork loin oozing with the summer sweetness of fresh peaches, a scintillating fruit and Jarlsberg cheese salad tossed with a curry-kissed dressing, and a smoky but cool grilled Roma tomato gazpacho. These Memorial Day recipes are mouthwatering and easy to prepare. Oil the grill and place whole tomatoes and bell pepper on grill grate and cook until skins have charred spots, about 6 minutes. Transfer tomatoes to a plate to cool. Transfer the pepper to a paper bag and let it steam for 5 to 10 minutes. When cool enough to handle, peel off the skin and cut pepper in half. Remove the stem and seeds and place one half in a blender. When tomatoes are cool enough to handle, coarsely chop them and add to the blender. Add half of the cucumber to the blender as well as the bread, garlic, vinegar, parsley, and paprika. Season with salt and pepper and blend until smooth. Add oil and blend for 20 to 30 seconds. 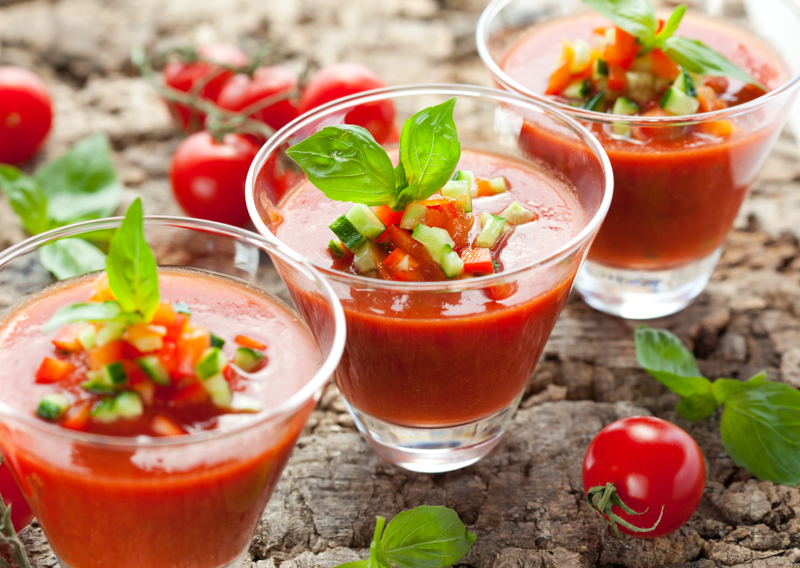 Transfer gazpacho to a bowl and refrigerate until chilled. Before serving, finely dice the remaining cucumber and bell pepper. Sprinkle on top of gazpacho and give it one or two stirs. Serve chilled or at room temperature. Combine all ingredients except for pork loin in a medium-sized saucepan over medium-high heat and bring to a simmer. Reduce to low and cook for 10 minutes, stirring occasionally. Pour through a sieve over a bowl, reserving the liquid and setting peach mixture aside. Pour liquid back into saucepan and simmer over medium-heat until reduced to about 1/3 cup of glaze. The roast needs to be cut and rolled out into one long flat slab of meat. Position pork fat-side up and insert a knife 1/2-inch from the bottom of the roast. Cut horizontally, stopping about 1/2-inch from the edge. Open this flap and cut through the thicker half of the roast about 1/2-inch from the bottom, stopping about 1/2-inch from the edge and open this flap up. Repeat until you get a long flat piece of meat that is about 1/2-inch border on all sides.Starting from the short side, roll pork loin tightly into a log and tie with kitchen twine at 1-inch intervals. Turn all burners to high on gas grill and heat with lid down for 15 minutes. Oil grate and leave primary burner on high and turn off the other burners. Place roast, fat-side up, on side opposite of primary burner and cover grill. Grill roast, flipping after 25 minutes, until instant read thermometer inserted in the thickest part of the roast registers 130 to 135 degrees F. Brush roast with half of the reserved glaze, flip roast again, and brush with remaining glaze, and continue to grill for 5 minutes. Transfer to a cutting board and loosely tent with foil, allowing it to rest for 5 minutes. Cut into 1/2-inch thick slices, removing twine, and serve immediately. Combine salad ingredients in a large bowl. In a small bowl, whisk together dressing ingredients and drizzle half over salad ingredients. Gently toss to coat. Serve remaining dressing on the side. If making ahead, keep salad ingredients chilled and toss with dressing right before serving.